Destin, FL (February 25, 2019) – Instinct. That innate, impossible-to-quantify impulse leading people toward a positive outcome. The world’s great anglers all share it in common: a gift for listening to that little inner voice that leads you to schools of biting fish. Interestingly, the same talent applies to business—a hunch for a new product that creates demand where it didn’t previously exist. Tim Mossberg, owner and founder of Fish Monkey Gloves didn’t invent the concept of angling handwear. But Mossberg’s first two years of operation have proved his instincts right on the money; the small fishing-focused company has already expanded to international distribution, expanding to over 600 dealers in 16 countries. 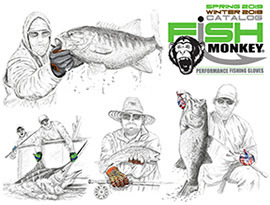 Fish Monkey Glove founder and owner Tim Mossberg listens to the ideas of elite anglers. “We learned fast there’s a real thirst for high-grade fishing gloves out there,” says Mossberg, who combined his lifelong passion for fishing with his longtime profession — the design and craft of premium apparel. An industry insider with hard-won experience in sales, sourcing and distribution, Mossberg founded his first apparel company over 25 years ago. (He also launched a well-known fishing apparel brand.) Through it all, fishing remained his principle passion. “I’ve been an angler since age 5 or 6,” he recalls. “Years later, my friend Gary Carter introduced me to bluewater fishing, and it just got into my blood.” The pursuit of giant marlin and tuna drove Mossberg to travel all over the globe, from Puerto Rico to Portugal. Eventually, he moved from Georgia to Florida to quench his craving for saltwater sportfish. As he fished in different boats around the globe, Mossberg observed a shocking lack of quality in the gloves worn by captains and their crews; gloves that simply couldn’t hold up or properly protect them from the rigors of the salt, sun or wraps of leader. “At that point, my opportunity and niche became clear — to give anglers a comprehensive array of the best fitting, most functional gloves for every situation. Today, plenty of glove companies focus on one or two areas within the sportfishing community, but no one offers an all-inclusive A to Z line. I set out to design a specific glove that matched every fishing scenario I could think of, and do it with input from the anglers themselves.” The final step beyond providing protection from fish and the elements was to give anglers a wide range of stylish, statement making color patterns. The fingers on Fish Monkey’s Free Style Glove can be custom-cut by the angler for the perfect fit and application. Intel for one of Mossberg’s first designs, the Beast Master Heavy Weight Wiring Glove, came from Captain Charles Perry, world-famous marlin man who’s wired more thousand-plus pound blue marlin than anyone alive. To help Mossberg enter the bass arena, professional angler Tim Horton stepped forward, offering key design data on Fish Monkey’s UPF-protecting Guide Glove series. Currently, Mossberg is working with ice fishing expert Brian Brosdahl on a new line of cold-weather gloves. “The difference is the work we put in, both in the design process and the preparation. I’m constantly travelling to our factories to make product improvements and to hold them accountable on quality. For example, we’ve noted a lot of ‘slop’ in the palm area of other sun gloves on the market. With our Guide Gloves, we’ve undergone countless iterations to arrive at the right material, stitching and fit. We added our signature Monkey palm print, a grippy silicone that gives you a rock-solid connection to your fishing rod; it gets even better when wet. “They’re so dialed in now that anglers tell us the Guide Gloves actually enhance on-water performance by reducing hand cramps and fatigue. Ultimately, that means more fish in the boat. The Beast Master Heavy Weight Wiring Glove was designed by legendary marlin man, Captain Charles Perry. 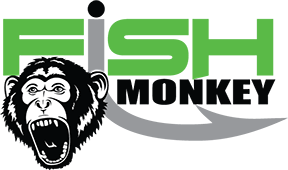 Another new product, Fish Monkey’s UPF 50+ Free Style Glove is a first-of-its-kind product that allows the angler to trim finger length to their own exacting preferences. It is uniquely constructed to not fray or split at the seams, once cut. “This design is already being hailed by bass anglers as well as bow- and spear-fishermen,” says Mossberg. Recently, to aid consumers in the potentially confusing purchase decision, Mossberg and his team developed what they call the ‘Glove Station Concept.’ The one-stop-shop retail display informs customers on which glove best matches their individual fishing style, rather than showing them an endless aisle of product. The new Fish Monkey Face Guard features comfort-added stitching and specialized venting to eliminate sunglass fog.